US Sen. Ben Cardin (D-Md.) got an update from Triumph Development co-founder James Fangmeyer on the progress of the future CSM Velocity Center to be built at the location of the old Ely’s Department Store in Indian Head. State leaders have been stopping by the site of the future College of Southern Maryland Velocity Center in Indian Head. 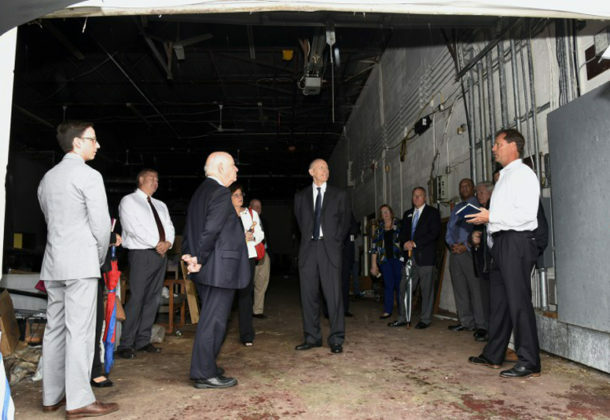 The most recent visitor, US Sen. Ben Cardin (D-Md. ), received updates on the public/private venture to develop a former warehouse into a complex for innovation and technology. The senator heard from college leaders, Naval Surface Warfare Center Indian Head EOD Technology Division, Triumph Development, and Mid Atlantic Development Partners. Once finished, CSM’s Velocity Center will offer resources for activities related to innovation, entrepreneurship, and workforce development and retention. The facility will eventually be 15,000-plus square feet, with space that will be useful for conference and open space offices, room for co-working space, cyber, and robotics competition labs and more amenities. The Velocity Center will be a place where innovation and education meet in collaboration with the community and NSWC IHEODTD. In 2017, the college was awarded a $500,000 endowment as one of three academic recipients of the Maryland Department of Commerce’s Maryland E-Nnovation Initiative Fund, a state program meant to spur research in scientific and technical fields at Maryland colleges and universities. CSM is the first community college to receive the prestigious award. The college has also received state funding for the interior build-out of the warehouse space. MEIF money has been endowed by the CSM Foundation and the interest earned will support the initiative and the college’s Entrepreneur and Innovation Institute with the expertise needed to expand CSM’s technology transfer curriculum; research and located regional technology transfer opportunities; instill entrepreneurial skills among students, businesses, and government scientists; and expand the local entrepreneurial ecosystem and workforce. The concept of the Velocity Center aligns with the strategic plans of the region’s naval bases —NSWC IHEODTD, the Naval Air Warfare Center – Aircraft Division, the Chesapeake Bay Detachment of the U.S. Naval Research Laboratory — and the Maryland Economic Development Commission and Southern Maryland Economic Development plan.